This is my “classic” version of French toast. I don’t really think it’s so much about how to make it, other than the bread that’s used. You use the wrong type of bread and it is just a soggy mess on a plate. The bread I recommend here in London is Tesco crusty white bloomer. For Americans a French loaf would work perfectly as well. You can gauge how to cut the recipe down for a smaller amount of people, but my recipe feeds 4. Alright here goes. Cut the loaf of bread in 1 inch slices or however thick you prefer. Set aside. Combine all other ingredients in a shallow baking dish with good surface area to soak the bread. Mix thoroughly and get all the sugar and cinnamon incorporated well to make the custard. Then, dip the bread slices in the mixture and press down, flipping once, to ensure a good soak. Heat a pan with a little oil or cooking spray until visibly hot. Lay each slice of bread down in the pan as many pieces as it holds and fry till you have a good crisp on one side and flip only once. Keep in a warm oven while the others are cooking, and voila you’ve made French toast. Drizzle with your favourite syrup. My favorite is New York or Canadian Maple Syrup! Fish Fry? NO! FISH PIE! When I first came to England, a frozen store bought version was the first I tried. I thought it sounded disgusting…to an American we think of pie as a sweet treat, hardly ever as a delightful entrée for a meal. But when I had it, it was one of the most delicious things I’ve eaten in the UK. I’ve tried to recreate it several times, and sometimes I was more successful than others. This is my most successful dish yet(if you’re looking for my low fat version), but you know, sometimes you have to let loose and just try new things, even if it means ruining your dinner! I hope you dare to try my dish, I’ve also cut corners to lower calories and make it easy as possible. I’ll specify where I cut corners if you want to try it the regular way. 4. Steam the cauliflower until tender. When everything is ready to be mashed, mash like you know how, add the Parmesan, milk and egg yolk. 5. Pour the pie filling into a casserole dish, top with spoonful’s of mash and you can optionally grate a tiny amount of Parmesan on top for color. Bake at ~160C for about 30-45mins or until bubbly (350F) I’ve posted a lot of pictures to show the process. I normally make my rice with white rice, but I decided to try brown basmati. It takes a little longer to cook and needs a tad more water than normal white rice, but I must say this is an excellent example where you need a shallow sauté pan with a tight fitting lid. Ok here we go. This recipe feeds 4. Heat the oil in the sauté pan, when hot, combine rice, diced veggies and spices in the pan and lightly brown on medium heat. This stage is important, make sure not to burn but gently brown until the spices become very fragrant. 5-6 minutes. As the pan is browning, measure out the water and open the tomatoes. Pour tomatoes and water in the pan at the same time with minimal stirring for mixing. Shake on some garlic powder , pepper and cilantro, also crumble the stock cube into the water. Stir a few good times to get mixed and TASTE. Taste is so important, if the broth is not as salty as you’d like it, add some more salt. The broth should taste the way you want the rice to taste. Bring to a LOW simmer and cover tightly, DON’T TOUCH! Cook for about 20 minutes, if you return to it and the edges of the pan aren’t cooked enough give it a big stir and add a tad more water if dry and let it go another 5 minutes. Turn the heat off and let it steam itself to perfection, and enjoy! Good Pots and Pans need Good Homes Too! This past weekend was lovely, and Sunday, my husband and I decided to go roam around for some things we’d been needing, and partly to shop for a bag that I’ve also needed. Turns out I don’t have much luck on eBay. I bought a bag in March and it was exactly what I wanted until the lining started ripping and falling apart and now the leather that holds it together is just trashed. Well we looked around and nothing caught my eye, and of course we ended up in the home ware section (my favourite of any store), we found some tea spoons that we’d needed and then we went to the pans. There’s always something culinary that I want, but I’ve been looking for a certain type of pan. My cooking equipment at the moment consists from handed down items, and the one pan I use the most is a £5 non-stick pan from Sainsbury’s (which has done me well over the 4 years we’ve had it I might add). I’m in no way complaining about the items I use every day but sometimes it’s time to update the classics. 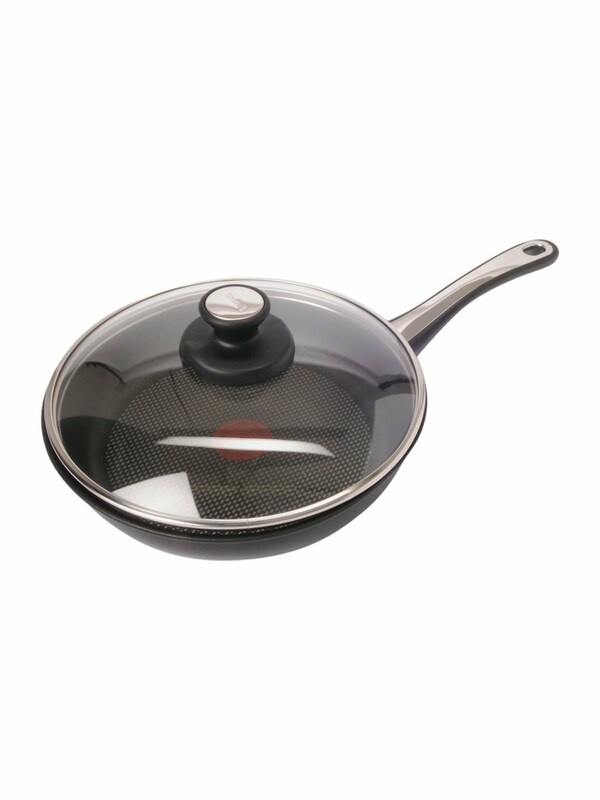 I have wanted a pan with a lid that could securely hold in moisture to allow ingredients to cook inside without having to add any extra oil to the mix, a very important thing for low fat cooking. I walked over the section maybe 5 times and just didn’t see anything in my price range that I was willing to settle on. My husband had been having his eye on this beautiful John Lewis cast iron grill pan for £33, which I think in the future it will be mine, but for now, I have a cheaper £5 non-stick one that I don’t use that often that can stay around. Then we saw on the bottom shelf seemingly hiding but at the same time ready to come home with us, a Tefal 26cm frying pan with a lid that you can turn the knobbly handle thing to let steam out or keep it in. This is excellent for stewing things and keeping that steam pressure in there to cook it faster and make it extra tender. Most important it’s non-stick! Non-stick means little to no oil! My first meal I made out of it was simple, I had some things in my refrigerator that needed eating, spring greens, wet garlic, kohlrabi and I sautéed those all up with onions and extra garlic, and added a can of black eyed beans and let it stew down to mush. It was delicious. What’s good about this non-stick pan is it can get to really hot temperatures so you can sear steak on it which I’m looking forward to trying. You can also finish things in the oven in it as its handles are made for the heat of the oven. All in all I think I got a good deal at £41. Most other pans that didn’t have lids were upwards of £60. When replacing items in your kitchen I feel like replacing a broken piece of crap, with another cheap piece of crap isn’t going to help you any in the long run. Invest slowly on small things one at a time and that way in the future you’ll have a kitchen full of the utensils that you love. Brown the beef with the spices and minced garlic. Salt and pepper as you like. When fully cooked sprinkle the flour and stir till it’s dissolved into the meat and cook for 3-5 minutes on low until the flour taste is cooked through. Next add the water, stir and bring to a small boil. Stir continuously. If the sauce is too thick after boiling for 1-2 minutes just add a little more water (1/4-1/2c more) slowly. You want the consistency of a creamy soup. Prepare a rolling station including, baking pan, cheese (set aside 1/2c-3/4c for top), grated onion. Next put about 1 ½ tbsp cheese and small strip of grated onion on the tortilla and roll it up and place in the pan. Pour the Enchilada sauce over the top of the rolled tortillas. Bake for about 30-45 minutes or until cheese and sauce is bubbling. Note: It’s hard to find a British cheese that melts correctly for this recipe but making sure you get mild instead of strong cheddar. If you can find a Mexican type shredded cheese it might work close to cheese in the Americas. This is just a great vegetable soup to make on a stormy day or when you want to have a big pot of healthy that you don’t have to worry about calories or fat because there is virtually none! It freezes well so I usually make too much and have it for later. My recipe is for a big pot so make sure you’re prepared with one big enough. The great thing about this soup is you chop everything up and throw it in the pot! Cook until all vegetables are soft and the flavour and taste is to your liking. This soup is so flexible because you can add any other vegetables you like to eat. You can also add rice or pasta to make it a little heartier but I just enjoy the vegetables. This is also a soup that’s very cleansing if you want to spend a day eating light, you can eat as much as you want to fill you up without the guilt of calories and fat. Have you ever had the delicious pita dip at your favourite Greek restaurant called Baba Ghanoush? This is a delicious recipe inspired by that classic Greek dish and a request from my sister-in-law who fell in love with a similar veggie patty at a burger joint. I knew that I had one type of veggie patty in my list of recipes but I decided to do some tweaking and see if I could get it to taste similar. You can substitute a lot of things if you don’t like one ingredient or the other, but the point is veggie burgers are EASY! This one is easy and good for you with lots of protein from the beans, and vitamin C from the red pepper. Enjoy, and if you have any questions with quantities please feel free to ask me for advice. Let stand to cool while preparing the other ingredients. Next drain the chick peas thoroughly and place in a bowl and mash. Combine all ingredients at this point and mash all together. Once the pepper has cooled slightly peel off the skin, roughly chop and add to bowl. Spoon the eggplant out of its skin and roughly chop and add to bowl. Heat oil in pan and form desired sized patties (if they are too wet then add another tbsp. of flour or a pinch of oats) and fry 3-4min. Serve on a bun with lettuce and tomato. You can use feta cheese or cheddar if you really dislike goat’s cheese, but I find the earthy flavour really compliments the spices! Basically, to make a good meal and to make it healthy, you’ve got to have the foundation. Healthy food doesn’t just happen by boiling a chicken breast and serving it on some plain bland white rice. This is what makes people stay away from eating healthy in their own home. It has to taste good and you have to have things in your kitchen on hand to improve your meals and to have healthy utensils to make a good snack, lunch or dinner. I’ve compiled a list of things that are in my cupboard (granted they are overflowing at the moment), that I use every week in my cooking. I’ve almost completely switched over to the ‘better for you’ option when it comes to certain products like, flour (whole wheat), sugar (sugar substitute for baking and cooking...), oil, etc... This is my list that I deem essential in Gina-land to get all her cooking done. Mind you I’m constantly collecting more and more things to design meals that I can cook faster and healthier so here are a few of my tricks that I’ve switched to. Olive oil – We all have olive oil in our cabinet but what do you really use it for? For the longest time it was just extra virgin for me and I’d use it to make dressing or fry in a pan. But I decided to get, in addition to, light or extra light olive oil. I moved to light because it meant I could nearly cut out any use for oils with higher saturated fats. (Which I’d use to fry an egg, or start a stir fry) I always felt so guilty using a lot of oils that might not have given me that extra boost of heart healthy incentive as olive oil does for me. There are also other ones good for you such as rapeseed oil (canola oil) and many others. But why not use that bottle you have every day. Canned Fish – I know I know, who wants to stock up on canned fish! But there are a lot of good reasons to have it handy. Tuna is what I keep a big stock of, always in water to keep the sodium levels down. Tuna is good for sandwiches and salads and every day lunches. There are also others like salmon (either with bones or boneless and skinless), clams, sardines, mackerel, and many others. Some I use strictly for lunches, but others I make whole meals out of, such as creamed salmon and spinach, or clam sauce over linguini. Look out for these recipes in the future. Beans – Beans can be your best friend in the kitchen. They’re so much more versatile than anyone thinks. Beans can go into stews, stir-fry’s, vegetarian burgers, curries, sauces...etc. The bean is an underestimated thing in the food family. One of my favourite ways to jazz up a meal is to make a sauce out of any kind of white beans, which I will post a recipe for later. The types that I stock are white beans such as cannelloni and black, and chick peas. You could use any type of variety to dress up a plain bowl of rice even. Beans are good and good for you! Citrus – I keep citrus fruit like lemons, lime and sometimes oranges. Limes are good for my cocktails ;) and lemons are great for cooking, and brightening up sauces and meals to add extra flavour without adding extra fat or salt. Garlic – Essential ingredient to a cook that doesn’t want to settle for less, I always have this stocked. Onions – So, I get that most people dislike onions, and I can understand that, but onions are equally essential to any cooks development of food. Onions are versatile and can do a myriad of things for your food at each level of cooking. I suggest you give them a second try if they’re not already on your list of things you keep stocked up in! If you want to cook my recipes, these are a list of ingredients that I find important to make most of my meals. It helps to keep things handy that you know you’re going to make and can make into something good. It always prevents me from going out and making a bad food choice. I hope that you have found this short list helpful, I sometimes can’t stop myself I could go on and on about spices, but this is the general rule most of my food ingredients. I can’t wait to post the recipes of things mentioned in this blog. Feel free to ask me anything you’re interested in! So, this isn’t much of a post, but last night I made some delicious roasted cauliflower. I’ve roasted it before with broccoli but I wanted to share my recipe. It’s a really great side and I know I always forget that so many vegetables can be roasted instead of steamed. What’s more boring than steamed vegetables! My recipe will brighten up any meal, so if you’ve got a head of broccoli or cauliflower, give it a go! Pop in the oven for ~20 minutes or the edges start to brown. So delicious! Please give it a try, and add other veggies as well. It’s really healthy and hearty so if you feel like cutting out a starch in the meal it can really fill the gap. Enjoy! Sometimes the quickest thing to eat in the world when you’re on the go is Chinese food. Who doesn’t love Chinese?! I know that I do, but it’s obviously such a guilty pleasure. And there are a lot of things going on in fast food Chinese that you just can’t replica at your own home, like those delicious little won ton things. Well, enough with that, we all know how to make a stir-fry or maybe we all don’t? I made a stir-fry as a quick meal the other night out of lack of time, effort and energy. I wanted to share the quick sauce I made up that could go with virtually anything you wanted. I made my stir-fry with lots of vegetables such as zucchini (courgette), carrot, celery, onion, mange tout (snow peas), cauliflower, leeks, mushrooms, yellow and orange peppers, and garlic. My protein in the meal was prawns (shrimp) but you could use anything your heart desires. After sauce has been prepared, go ahead and start your rice or egg noodles, whatever you’re eating with the stir-fry. Then, add sauce and prawns and cook until vegetables are as firm or soft as you like. This is just my version of a quick stir-fry, none of these ingredients are essential to having a great stir-fry. Anything that you like can be used, for instance you could add cabbage, or bean sprouts, or anything you have. The point is, the sauce is versatile, and you can make it as spicy or non-spicy as you like. Everything in cooking is about tailoring to your needs. As you can see this can make for a quick dinner, or it also keeps in the fridge for a delicious light lunch the following day. Beef up the fibre and serve with brown basmati rice or whole wheat egg noodles. Tofu is a great addition but I suggest you cook it separately, look out for my tofu marinade, guaranteed to make tofu taste like you’ve never had it before. Enjoy! As a child, one of my favourite things to eat was spaghetti, sitting in the kitchen handing my mom ingredients or cutting things up for the sauce, the garlic bread, salad… the whole meal was an experience I remember with clarity. As I got older and I would come home to visit, I’d watch the beef fry in the pan and the grease float around the pot...it became a less than appetizing experience for me. So as an adult I had to adapt the recipe for my personal lifestyle, by making vegetable spaghetti, or substituting the beef with ground turkey or even soy mince. But, sometimes it just doesn’t taste like mom’s. Fortunately I feel like I’ve made a good balance between the two, my mom’s and mine, to find something that gives me the homey comfort of mom’s, but done my way. When I first moved to England the dish they made that was very similar almost exactly the same is “Spaghetti Bolognese”. For testing recipe’s sake I looked through books and made the recipe from traditional ingredients such as beef. After I got it once, it was time to make it mine and take ingredients from its traditional recipe to enhance my own personal recipe. When this happened it became another favourite in my house, and especially for leftovers. It freezes remarkably and is versatile in that you can cook it for multiple guests or cook it to freeze for fast meals during the week. Although I’m in no way stating this recipe is “fast”, if you follow my steps you can cut down on your time so that you can get back to your glass of wine or guests faster. Another change I do to bump up fibre is I use whole wheat pasta, anything you like will work but if I can add some extra nutrition in there I always squeeze it in, as long as it doesn’t sacrifice too much of the flavour, but I find that I quite like it and I’d even go as far as to say that I like it better. Again, this recipe has a lot of ingredients, and can be changed any way you like, it’s the technique and steps for preparation that make it important, and if you wanted to make it vegetarian with soy mince, or just vegetables, I would omit the wine from the recipe and just drink it instead :) So without further ado. In a large sauce pot heat the oil, then add mince turkey, carrot, celery, onion, and pepper, oregano, basil, and stir until the meat is all browned and the veggies have begun to break down. Turn up the heat and add wine, stock, tomatoes, bay leaves and stir. Bring to a hard boil and boil for about 5 minutes then reduce to a simmer and stir occasionally until most of the liquid is evaporated (this is important) and all the vegetables are soft and cooked through. Taste and add as much sugar as you need to balance the acidity. Salt and Pepper as needed. This could take anywhere from 1hr to 2hrs depending on how quickly you want to get done with it. At this stage it can just rest and simmer while you entertain guests, make the salad, garlic bread or do other things, sit back enjoy some wine and let it develop itself with delicious deep earthy wine flavour combined with herbs it’ll make it worth the wait. Cooking shouldn’t be a race, but however I do know that with feeding families it’s important to get the food on the table. As long as you follow the steps or use the same ingredients you should be able to adapt it to your cooking style after you get the groove of it. I hope you enjoy eating this as much as I enjoy making it. To adapt it to a vegetarian, use any diced vegetables you want, I like to add frozen spinach, courgettes (zucchini), eggplant (aubergine) anything you could possibly want. If you really wanted to add wine, I would just add less. But other than that it should be very adaptable. Enjoy!